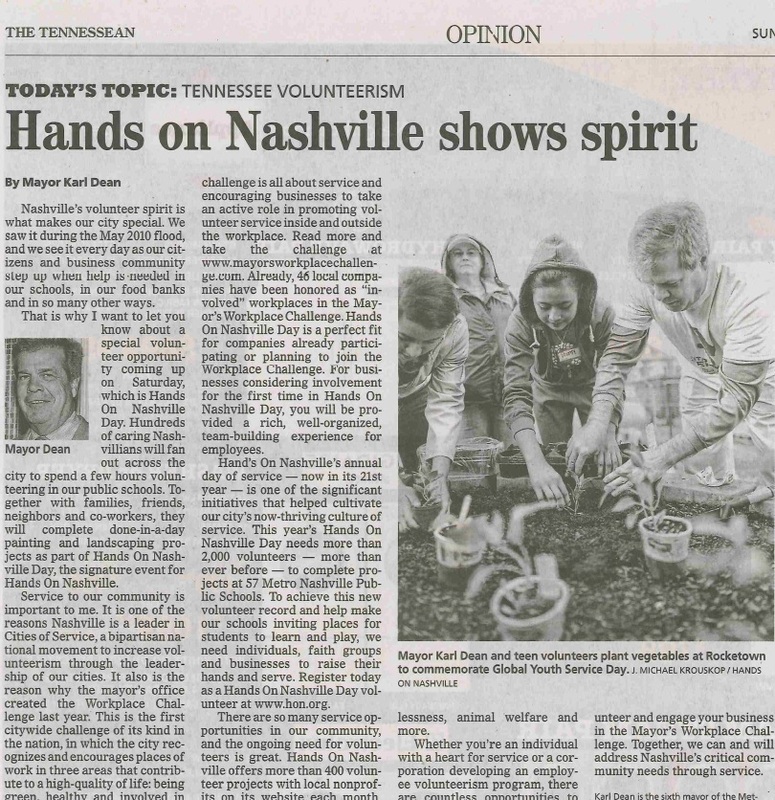 Thanks to Nashville Mayor Karl Dean for his column in today’s Tennessean about ways businesses can get involved in volunteerism – including Hands On Nashville Day and the Mayor’s Workplace Challenge! Read the mayor’s column here. 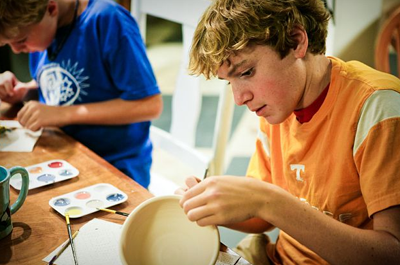 If your business or organization is interested in signing up for Hands On Nashville Day (coming up this Saturday, Sept. 22! ), check out this page with all the info you need to know. Read more about the Mayor’s Workplace Challenge. And ask your boss if your company is participating. Thursday, Oct. 18, 11:30 a.m. to 12:30 p.m. Representatives of Nashville businesses and organizations are invited to a Lunch & Learn hosted by KPMG and Hands On Nashville to find out how to participate in the Mayor’s Workplace Challenge. Hear from representatives who have taken the challenge and learn how your business can get recognized by Mayor Dean for its civic involvement. Complimentary lunch will be provided by KPMG. RSVP by emailing Allison@hon.org. LAUNDRY FOR 40,000? New store opening? JUST DO IT! The Nike Factory Store in Opry Mills was one of 2,773 Nashville businesses that sustained flood damage in May 2010. And like many, many Nashville individuals and businesses hit by losses, the store’s owners and employees responded with giving instead of placing themselves first. Now, almost two years later, Nike celebrates a grand re-opening with memories of how Nike greatly re-bounded from the flood. 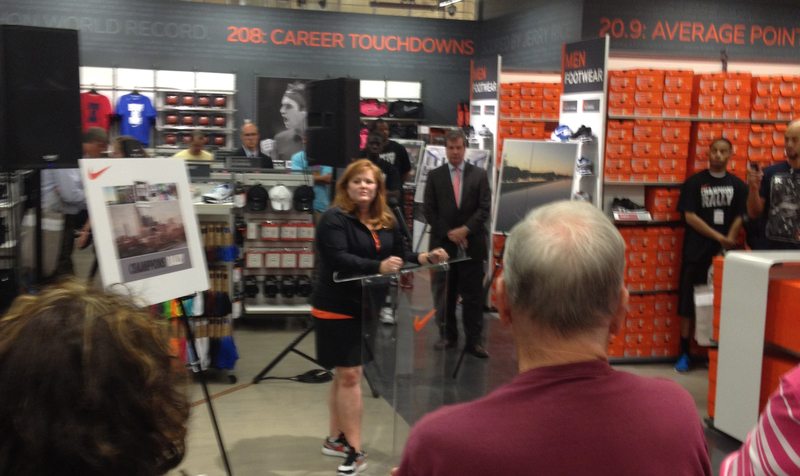 Beth Sessler speaks on behalf of Nike. Because of her great passion to help others and lead, Nike staff laundered and gave away over 40,000 items to flood victims. Store manager Beth Sesler recalls how volunteers just started contributing to what turned out to be one of Nashville’s biggest clothing giveaways. “The easiest thing we could have done, and the quickest thing as far as remediation for the space was concerned, would have been to destroy all of the merchandise,” she added. 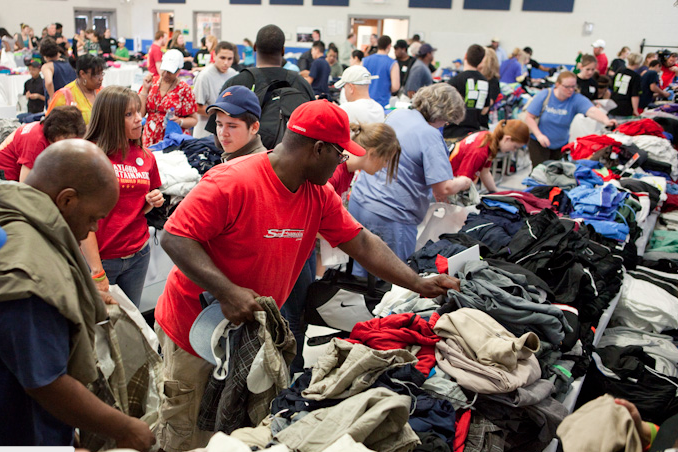 Flood victims were able to get free clothes from Nike just days after the Nashville 2010 Flood. Doing what’s easy is not always what’s right. Beth saw an opportunity. Their destiny became the organization of a community-wide volunteer project that placed the store’s 40,000 pieces of merchandise in the hands of flood-impacted families served by Metro Schools and local charities. “We all knew that it had to go to the flood victims. And we had to do what we could for the community,” she recalled. The process of preparing the Nike Factory Store’s clothing for donation had begun. Beth’s team took merchandise from their store. Under a circus tent set up in the Opry Mills’ parking lot, they removed clothing tags, sorted the items by size, bagged the merchandise and placed it in eight portable storage units. Then, the soiled product needed to be laundered. Beth sought cost estimates, and she connected with UniFirst, a uniform and work wear provider. To her delight, they stepped up to handle this enormous laundry project. Another photo showing Nike's generosity after the Flood. Working in concert with Hands On Nashville and Metro Nashville Public Schools, a giant clothing giveaway event was planned for McGavock Elementary School. Metro Nashville Public Schools’ students, faculty and their families, along with other flood-impacted households served by Catholic Charities of Tennessee, St. Paul A.M.E. Church and Bellevue Church of Christ were invited to attend. 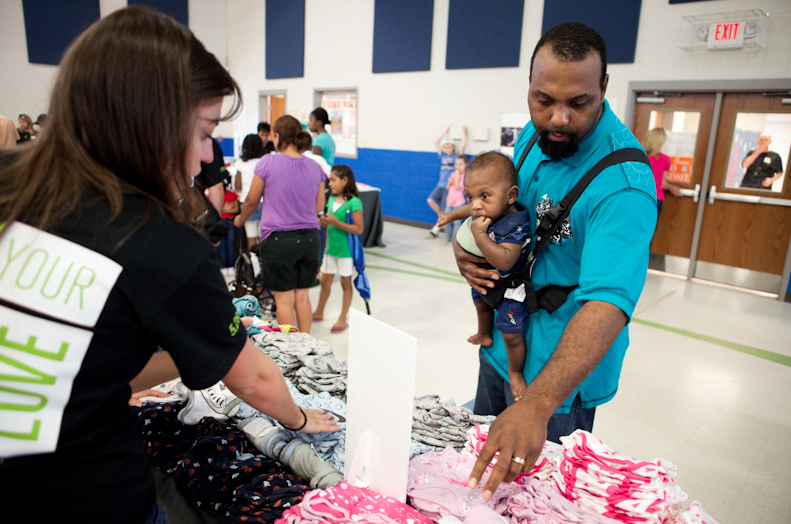 On May 28, about 2,000 people entered McGavock Elementary School’s gym to take advantage of this generous offer, receiving 10 articles of clothing and six pairs of socks per member of each household. A 150-member volunteer team was there to support Nike’s vision and ensure a special shopping experience – free of charge – that was equivalent to shopping at a Nike store. Beth, who has done other volunteer work ever since she was a child, said the delighted reaction from children that day is something she will remember. Last night was the Nike grand re-opening. Beth, Mayor Karl Dean, Brian Williams and many others told stories and reminisced on their teamwork during the 2010 Nashville flood. It was a wonderful celebration filled with pride and accomplishment. Their story will continue to be shared and remembered as one of the wonderful response efforts from the 2010 Nashville Flood. Thank you, Nike! 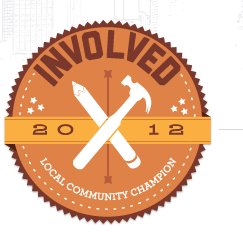 Make your 2012 resolution to volunteer. Change your life (and your community) and see great benefits. Ready to volunteer this winter? Try helping out at a local food pantry. Skill Development: Want to learn about your home and gain a better understanding about best practices to make it more energy efficient? Volunteer with Hands On Nashville’s Home Energy Savings program and get hands-on exposure to common issues while helping improve the energy efficiency of a low-income home in Nashville. You’ll really turn some heads as you mention the “.5 GPM dual-thread sink aerator” you now know how to install. Or… Interested in learning about vegetable gardening? Volunteer with HON’s Urban Gardening program. Or check out one of the many opportunities on the HON Opportunity Calendar. Self-Confidence: The CNCS article says it best: “Volunteer activities can strengthen the social ties that protect individuals from isolation during difficult times, while the experience of helping others leads to a sense of greater self-worth and trust.” Just the simple step of signing up for an upcoming project can seem daunting, but accepting the challenge and making that commitment will build your confidence. Use your specific skill and help a cause you believe in. You'll see great improvements in your life, both physically and mentally. Personal Health: Studies looking at the effects of volunteering (specifically Arnstein et al 2002) found improvements in both mental and physical heath. Patients who volunteered for six months showed decreased symptoms of depression. Arnstein attributed success to patients “finding a sense of purpose” and “making a connection.” Additional studies have found volunteering linked to lower mortality rates and other significant health benefits when individuals volunteered around 100 hours per year (or roughly two hours per week). Relationship-building: Volunteering exposes you to all sorts of people with all different backgrounds – and you are allowed to dabble to find which opportunity is the best fit for you. Try sorting clothes at ThriftSmart or prepare hot delicious meals for the homeless in West Nashville. Different experiences will connect you and expose you to many different people. Check out the recent blog post written by youth volunteer Allyson Burgess about her experience volunteering at Edgehill Community Center. Another popular opportunity this winter: Try regularly serving at ThriftSmart. Impact the Community: The most incredible reward about volunteering is the difference you make with your unique talents. Try to find ways to improve the issues you care most about and you’ll find your individual spin on how to solve problems. Regularly volunteer and you’ll see a clear picture of how you helped your fellow neighbor, family, environment, or friend. Consider lending your specialized skills to an organization that has a mission you really believe in. Arnstein, P., Vidal, M., Well-Federman, C., Morgan, B., and Caudill M. (2002) “From Chronic Pain Patient to Peer: Benefits and Risks of Volunteering.” Pain Management Nurses, 3(3): 94-103. Eat at The Wild Cow on Tuesday and Support HON! Thanks to our friends at The Wild Cow Vegetarian Restaurant in East Nashville, Tuesday’s BE Hive Buffet will support Hands On Nashville. From 4 to 9 p.m., they’re offering an all-you-can-eat vegetarian buffet (Italian-ish!) for $10, with 15% of proceeds supporting HON in our mission to meet community needs through volunteerism. The menu sounds tasty. (Never been? Even if you’re a meat lover, The Wild Cow works magic on veggies and tofu). They’ll be serving up tofu alfredo with butternut squash, artichoke and mushroom pesto, roasted veggie marinara, seitan parmesian, italian falafel, and more. Check it all out on the facebook event page. The Wild Cow is located at 1896 Eastland Ave. in East Nashville. Thanks to the folks at The Wild Cow for their support!! When the folks at DaVita Kidney Care approached us about coordinating a service day for their employees d uring the company’s conference in Nashville, we landed on sprucing up the building that houses East Nashville Cooperative Ministry (ENCM). It was clear to DaVita that this small-but-mighty East Nashville nonprofit impacts a lot of lives, and that the building where it does so much good work – helping the elderly, poor, disabled, unemployed, and disadvantaged with emergency food assistance and empowering community wellbeing through food security – didn’t quite reflect the beauty and potential of its work. As we dug into the needs of the facility, it became clear that the building would need a complete renovation. 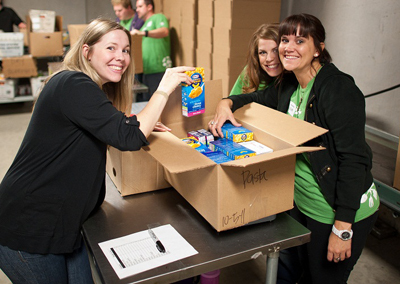 DaVita (based in Denver, Colorado) and the Nashville community stepped up to the challenge. For the past few days, volunteers from the community have been working through the sunshine and the rain to tear down walls, set fence posts, build scaffolding, and more. Tomorrow, 180 DaVita employees will descend on the small building on Gallatin Road to paint an exterior mural on the side of the building, construct fences and arbors for the vegetable garden, build indoor and outdoor tables, paint and install shelving, paint interior walls, and build planters. Dozens of community members will continue to volunteer over the next few days to complete the project. And on Monday, after Second Harvest Food Bank of Middle Tennessee restocks its food pantry with staple food items and produce, East Nashville Cooperative Ministry will unveil their renovated facility – a space that will enable the organization to meet the rapidly increasing demand for emergency food assistance, provide food education to the community, engage more volunteers, and improve the curb appeal of the neighborhood. As ENCM executive director Alan Murdock says in the news release that went out yesterday, “The renovation will not only help expand our services and volunteer programs, but it will also put the agency in a position to provide more healthy food choices, and expanded gardening and cooking education to our clients and the community on a more consistent basis.” While a building certainly isn’t everything, the space within which ENCM operates will be forever changed after this week. All thanks to the vision of caring businesses and Nashville volunteers. And that’s a powerful thing.